BlackBerry Curve 9350, 9360, and 9370 Announced! Now it’s time for the Curves to get that latest BlackBerry 7 OS! 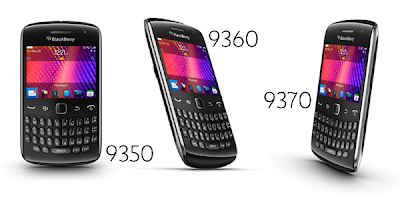 Just announced earlier today from RIM’s headquarter are the new smartphones in the more-affordable Curve lineup – the BlackBerry Curve 9350, 9360, and 9370. And like the latest yet still upcoming Bold’s and Torch’s, these new Curve handsets will carry RIM’s latest BlackBerry 7 OS which is promised to offer better web browsing experience, alongside with connected apps through BBM 6 and integrated services like BlackBerry Protect (similar to Apple’s Find My iPhone) and BlackBerry Balance which allows users to compartmentalize personal and work-related files without compromising the IT department’s need for advanced security and IT controls. The BlackBerry Curve 9350, 9360, and 9370 basically shares almost the same hardware characteristics which include 512MB of RAM, an 800MHz processor, 5MP shooter, NFC support, 2.44-inch 480 x 360 display, 1000mAh battery, and comparatively speaking – they are all slim at just 11mm or .43-inch. So what are the differences? Well, one is the storage. The Curve 9350 and 9360 both got 512MB of built-in storage which is only half compared to BB Curve 9370 at 1GB. Although these three bad boys will all support microSD card of up to 32GB, so I guess unfair built-in storage may not be a bummer after all. What’s more? Well, it seems like the Philippines will only get BlackBerry Curve 9360 as it’s the GSM variant. The BB Curve 9350 and 9370 are both CDMA devices so it’s unlikely RIM will bring it here in the country. Am I right Globe Telecom and Smart? All of these new BB Curve phones are expected to be available in Canada this month, and from other carriers around the world beginning in September. Official prices are still yet to be known. Peep on the press release after the break. Previous PostSun Cellular Also Offer BlackBerry PlayBook Plans Bundled with BlackBerry Smartphones! Next PostBlackBerry App World 3.0, Out Now! Gigabyte unveils the Aorus notebook line for gaming, packs dual GPUs and measures under an inch thick!